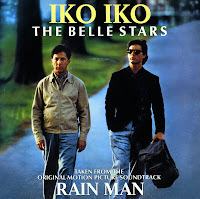 I've seen the Belle Stars, or at least, three of them, during those Here & Now tours at the beginning of this century in the UK, and one of the staples in their set was their version of 'Iko iko'. 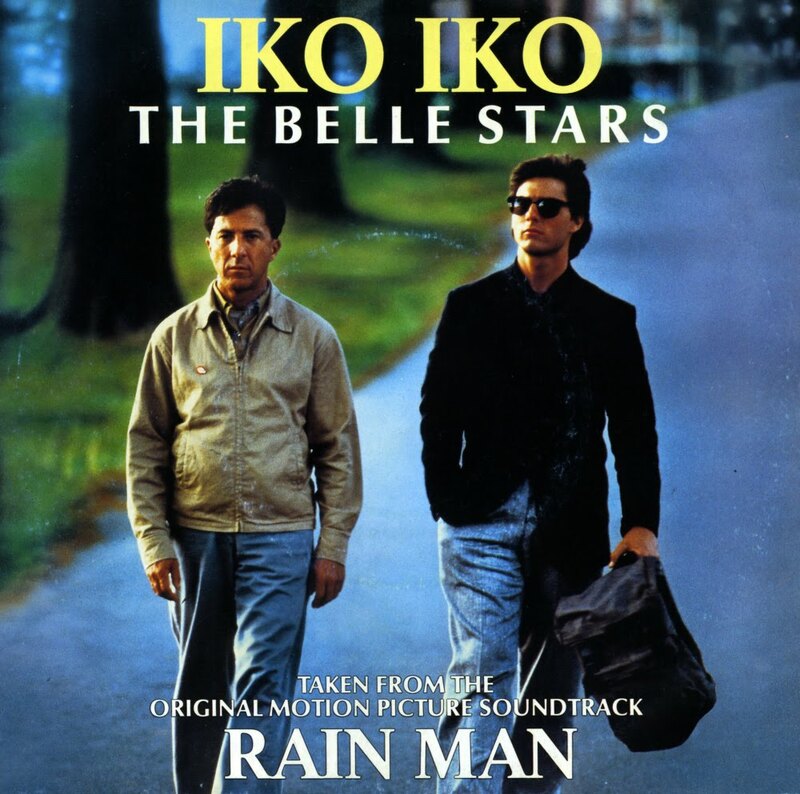 I never found the single of that track, but here it is... a reissue of the song because, apparently, it was used in the movie 'Rain man'. Originally, the track was released six years earlier, in 1982. It reached number 35 in the UK singles chart. This re-release gave them a number 14 peak position in the US Billboard Hot 100 chart and a number 7 peak position in Australia. The single also re-charted in the UK... peaking at number 98. 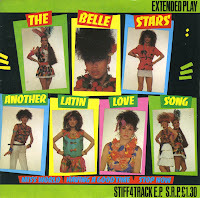 The Belle Stars made a name for themselves in the London club circuit when they started performing in 1981. Within a few months they appeared on the front cover of Sounds magazine. They were signed by Stiff Records. The band's debut single, 'Hiawatha' was released in the late spring of 1981. This single failed to chart, just like the follow-up 'Slick trick'. Their third single was this EP, with the lead track 'Another latin love song'. Again, it failed to break into the charts. The band finally found success with their fourth single, a cover of the song 'Iko Iko'. 'Mockingbird' was originally a hit for Inez and Charlie Foxx in 1969. The song was covered by James Taylor and Carly Simon in 1974. 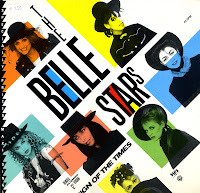 The Belle Stars released their version of the song in October 1982. It was only a modest success, peaking at number 51 in the UK singles chart. Only this year I bought the 12" single of 'Sign of the times' by the Belle Stars, but I've had the 7" single for years. I bought my copy during a holiday in London 16 years ago - and then again a few years later as I'd forgotten I already had it. The song borrows loosely from Sixties Motown tracks, but sounds very Eighties production-wise. The single peaked at number 3 in the UK and the Netherlands. 'The clapping song' is a song originally recorded by Shirley Ellis in 1965. The lyrics of 'The clapping song' are reminiscent of a nursery rhyme or jump-rope rhyme, and also feature instructions for a clapping game. 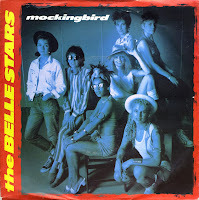 The Belle Stars covered the song in 1982 and it provided them with their first top 20 hit. This picture disc was a great item, one I couldn't resist buying even though I wasn't really impressed with the song. 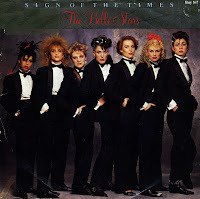 In January 1983 the Belle Stars, an all-female group consisting of Stella Barker, Sarah-Jane Owen, Miranda Joyce, Penny Leyton, Judy Parsons, Lesley Shone and Jennie Matthias, released 'Sign of the times'. It peaked at number 3 in the UK singles chart, and would become their signature song. I bought the 12" single today, being rather surprised because I'd never seen a 12" single of this track before. This 12" single was made in America.